The world seems to tilt sideways as you grip the weapon in your hand. Sweat drips down the sides of your face as you zone in on the one thing you know you must destroy. The one thing that's been eating at you all year. And as you lift your weapon, ready for the kill, only one thought runs through your mind. You're either going to conquer this piece of crap or go down trying. 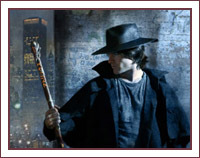 Looks like you're either ready to beat some vampires to the pulp or you're making a goal list for 2012. If it's the former, I'm sure you'll win. The latter? I know I'm not that confident in my chances. Instead of rambling further, because I'm sure you need a break from my thoughts, I thought I'd pass this one onto my lovely. If there is someone on this planet that doesn't know the meaning of the words, "I can't" it's Aaron Shamy. This was a scholarship application video he submitted a couple years ago. (Yes, he did get the scholarship *winks*) If you're looking for some motivation on goals, take a look! What's on your list for 2012? Do you have a list? Do you write things down and check them off? Or are you like me where jumbles of ideas bang around inside your head all year and sometimes something gets done? Great post. I am feeling much the same way lately. Love the motivational video, too! WOW. I just watched the video. Your husband is awesome! Haha! I love my man, but I have to admit he's not *quite* that motivated, haha! You're a lucky gal Red Head! Well done, Aaron. You've got my vote. What a great video. I would've totally voted for him. I don't really makes goal, except the reading/bookish kind. And LOL, Cort! You know I almost didn't post that video because of how gross I looked? *laughs* Feels good to be done with babies! LOL. WOWEE. I've never done a list before- probably because of the fact that I might not achieve some of them, but hey- who says I can't? Certainly not Aaron Shamy! Ok, Morgs, I couldn't get the video to play so I took it to YouTube and it worked. WOWOWOWOWOWOWOWOW! Aaron is cool in person, but supercool in that video! If I ever was a wrestler, he'd be in my corner! Your hubby set a world record for pull ups??? Brad says that when they were in junior high he did 100, what did he have to do to set the world record? Cuz, wow, that's a lot. If you ever give up, I give up. I'll rip that new website down faster then you can say "no". So, no more "oh, well, maybe, I dunno" talk from you misses. Nope. It's YES, I WILL, I CAN. If not, then I'm going down with you. Last Day To Enter For The Giveaway!